TNDGE - Tamil Nadu Directorate of government examination invites application for the post of School Lab assistant throughout tamil nadu. The total number of Vacancy is 4360 Posts. The Detailed notification, eligibility, syllabus, exam pattern, selection procedure will be published soon in Tndge website. 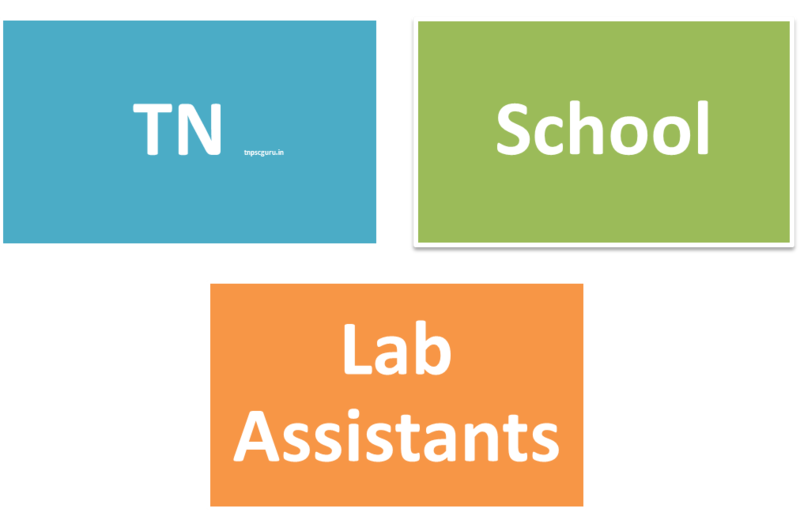 You can apply for this Tamil nadu School Lab Assistant post through the Nodal centres only. You cannot apply online yourself / through post office. The List of nodal centres has been published for many districts today (22nd April 2015). From April 24th onward you can go to the nodal centres and apply for the exam. Also carry all the prescribed document which is mentioned above. Candidates will be shortlisted based on the Marks obtained in the written exam in the ratio of 1:5 for interview. Stage 2: After the interview, candidates will be provisionally shortlisted for posting. Government Girls Higher Secondary School, Peraiyur. Anish sir district wise cut off viduvagala post man exam pola illa,totala ella districtkum serthu overall rank list vitu athula irunthu select pannuvagala.nama other districtlaum aplly panna mudiumgala sir. you mean to say that no need registration card if the cut off date is not mentioned in the requirement. Note - i have not registered in employment office my qualification. B.E., degree holders are eligible for this job?? please please reply me..
Sir, My employment registration in madurai. shall I apply any one nodal center were they given. sir can i get a previous year question papers or model question paper for this. hi anish can i aply for other district..
i am trichy ? nodal center for trichy????????????? How to apply it? I didnt see any link to registration? Please give me the link to register. for Lab assistant post Experience Certificate mean what type of experience sir pls explian that ..
Is the employment office registered is must? If we do now, will be acceptable? Sir I am BC - female. my group 2A mark 217.5. 145 questions correct sir.my overall rank 3785.communal rank 2076. is there any chance for 2nd phase counseling sir. when is 2nd phase counseling sir. How to apply in online? I have finished my Higher secondary school education and I am 33 year old BC female candidate. Can I apply for this job? Plz advice it. The cut off date for Age is 1.07.2014 so if you have passed SSLC only means you cannot apply. for that you have to apply through the nodal centres in Villupuram district (Vilupuram is district not state)..
Is it necessary to register in employment office? In notification the cut off date is not mentioned. So shall I register in online tomorrow for employment office registration. After shall I apply for this post? thoothukudi nodal center and vacancy sir pls reply? sir i was worked one year for lab assistant post in govt school in temporary ...now i am asking experience certificate but that school management not giving because now they appoint past retired person cousin brother to that post....then they told its all are just formality...already that cousin brother selected and appointment order also he got so dont apply dont waste money .....what can i do sir....this VACANT is just formality or true ?????????????????????????? Sir now m studying b.Ed course in current year, my all original certificates have been submitted college, xerox only in my hand so how can I apply for this job...? Hi sir..my brother completed 10th standard...but not registered in employment office..kindly assist me wts need to be done. next?? What is the pay scale for lab asst? Sir, thoothukudila boyskku cna vana school and girl'skku victoria schoolla register pannanum. see dhina thanthi yesterday paper. What is the Vacancy for Thoothukudi?? frnds i am d.ted complete. salary qualification basis la kudupangala. evalo salary code pannirukanga sollunga. Iam lakshmi anish anna. Thoothukudila yenna doubtnalum yengitta kelunga.Iam in tuticorin. ICM priority certificate is valid for priority category so don't miss the opportunity. Naa employement office la register pannala. but degree 2006 la degree mudichita. naa apply pannalama? Employement office la kandipa register panni irukanuma? can i apply for this post? i have completed degree. my age is 36. I am staying in Chennai. My native district is Tirupur . Can I apply in Chennai for my district? sir inter caste marriage quato is available please tell me sir. anish sir .please reply sir.i am senthil.written test marks merit kku thevai illaya sir.wriiten test eligible test mattum thaana sir. sir pls guide me . madurai dist vacancy for bc male evlo? i saw the notification for madurai dist. . i am bc candidate. i know BCM means bc muslims . what is mean BCO? please give me online registration link..
sir itz urgent , pls reply me . In my employment card, in the place of medium for sslc, tamil medium have been printed.But i studied my sslc in english medium. I didnt change the medium for past 6 yrs, now i doing my final yr b.tech -it ANNA UNIVERSITY(spcet college) , and going to complet it on may-5, 2015. Is there any problem in applying Tamilnadu school lab assistant exam.????? Becoz for this exam, priority certificate(i.e ex-service man, tamil medium, widow certificate) is also one of the document required while filling online application in nodal centre. Is there any problem sir, reply me sir . sir my mother was born in 1883. may she apply for the lab assistant posts? please reply me. my email id is bhuvanasangee00@gmail.com please consider my plea. I am Mageshwari.I Completed B.Tech Information Technology.am i eligible for this post.And to be noted,i registered employment office through online mode,will it be eligible ah sir.i dont have any registeration card. I have another doubt,u mentioned cut off date,wt it means sir. kindly reply it,clear my doubts sir plz plz....And I am from vellore. I AM 35 YEARS OLD. B.S MATHS . BUT I BELONG TO OTHERS ( FC) CATEGORY. MY MARRIAGE IS INTERCASTE. HOW CAN I APPLY FOR THIS POST. ANY IDEA. PLEASE GIVE ME A GUIDE LINE. sir i am SSLC failed but open university degree completed please advice i am eligible are not please please sir reply me this is of my life. hi sir now i am in katpadi vellore. My native is erode i have my employment card in erode only am i eligible to apply for vellore dt? There is no online registration for this posting. can i apply for this exam if i register employment today? Hello Sir, Is obtaining interview marks max 15 is must to get posting????????????????????????????? Pls reply me, I have completed my B.tech - IT in 2015, May. I have course completion certificate, whether am eligible to apply tnpsc grp-2(interview post) sir??? IF YOU CLEAR all your semester without arrears even 8th semester also,you will apply..
how you got this doubt??? sir pls tell me, what is the cut off mark in lab assistent?? Anish sir my marks wil be come around 90-100 MBC Thirupur DT...whether am having eligible for next round? Ya sure. this is final chance to get job?????????? I got 90 marks in lab assistant exam. I am in MBC community with tamil medium priority. I have completed B.Sc , B.Ed. My Employment seniority is above 10 years in Tirunelveli dist. Can i get this job ? Mr.Lee i have doubt.post based on district wise like informed to us.i m kanya kumari dist.if i have good mark score but post are filled in kanyakumari dist mean that time vancant in other district mean they will give job to me or not? any body reply to me? what is your expected mark? Dear frnds , question paper is quite easy. But it is little bit tough to score 135+. And some peoples may got that mark. But cutoff will be 100+. In group 4 and group 2 exam 160 is the cutoff . in that 160 question they score around 90+ marks in GT or GE. Moreover 12 lakhs candidate appear for group 4 and vao exam. And after completion of written exam there will be certificate verification. In lab assistant it is a screening test. So cut off will be quite low only. surely result will come at the end of this month. my score is 115,BC with ICM priority, villupum district. is it possible to get post with out money. pls tell me anybody.